If you’re looking for an easy cake that tastes great and makes the house smell good, here it is. I baked “Lunchbox Applesauce Cake” on Sunday. It smells a lot better than a Glade plug-in and tastes better too. We tried this a few hours after it was baked and it was delicious. However, it tasted even best on the second day so we sliced the leftovers, wrapped the cake slices in cling wrap and took them to a construction crew. The hokey name comes from the fact that every time I think about this cake, I think of some 1950’s construction worker sitting on a scaffold eating this cake out of a tin lunch box. 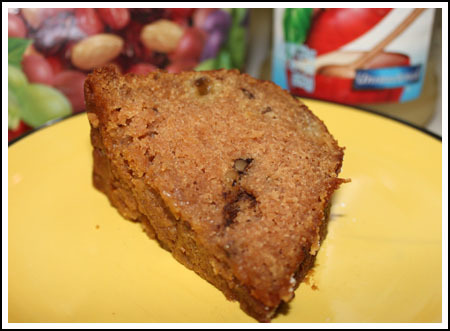 Lunchbox Applesauce Cake is a basic applesauce Bundt cake with raisins. Preheat oven to 350 degrees F or 325 if using a black Bundt pan. After you’ve sifted the all purpose flour and measured out 2 ¼ cups, mix it with baking soda, salt, cinnamon and nutmeg. Grease the pan with shortening and dust with flour or spray with flour-added cooking spray. Beat the butter until creamy. Add the brown sugar and continue mixing. Add the eggs, 1 at a time, and vanilla, then mix until well blended and fluffy. Add applesauce to the creamed mixture and stir well, then gently stir in the flour mixture, scraping batter up with a rubber scraper to ensure it’s incorporated. Fold in the raisins and walnuts. Pour batter into prepared pan and bake 45 minutes or until cake tests done. Let cool in pan for 10 minutes, then turn on to a wire rack to finish cooling. « Cook’s Illustrated Fluffy Yellow Cake — Best Yet! I loved Snackin’ Cakes! They were one of the first things I was allowed to bake “on my own.” This recipe totally reminds me of them! Sue, I had to eat the school lunch too. Maybe that’s why I think of a construction worker instead of a cute, lucky child like Louise whose mom packed her applesauce cake. Jennifer, I remember those! They were called Snackin’ Cakes. I used to make those when I was a kid. Mackenzie, I’ll have to check your blog and see if you made it. I hope you try this recipe. Karen, thanks! How did your Sweet & Salty Chocolate Cake from Baked turn out? Darlene, I used the no-sugar kind. The Motts should be perfect. Did you see a hunky construction worker named Lucky? They definitely were lucky to be chosen by you. The cake looks delicious. Do you think I could make it in a 9 x 13″ pan? Thanks! Your cake looks moist and delicious! I wish I had your willpower to give away more of my baked goods. Did you use regular applesauce? I only have Mott’s Natural No Sugar Added right now. Reminds me of the carrot-applesauce bundt cake you did way way back, that recipe is OUTSTANDING and I just might have to dust it off and bake it again very soon! You read my mind! I was just thinking about baking an applesauce cake! “…smells better and tastes better than a glade plug-in” LOL! That does look delicious. For some reason it makes me think of those cakes that used to be a mix in a box, that came wtih a little (cardboard) pan to cook them in? Do you remember those? I wonder if there was an apple spice kind of one? It looks fabulous and I’m sure it smells even better than it looks. I would have been jealous if the kid next to me had that cake and I had school lunch.